Joanna Grymek and her teammates shot a lot of layups Friday night in the Green House. 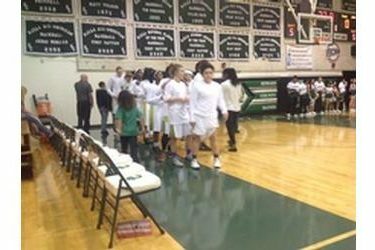 Seward made it look easy against Fort Carson 93-26. Joanna Grymek led the way with 28 points and 11 rebounds. Daniela Galindo and Neidy Ocuane added 12 a piece. Manuela Fungate scored 10 with seven rebounds. The Lady Saints led points in the paint 56-8. The Lady Saints starters, who played most of the first and third quarters out-scored the Lady Lions (4-3) 54-4 in the first and third quarters. Seward’s defense held Fort Carson to 17 percent shooting (11-66) Seward is 6-1 and faces 4-3 Frank Phillips Saturday night at 6 in the Billy’s/Days Inn Classic in the Green House. FPC lost to Hutchinson 78-53 Friday in the Green House. The SCCC-FPC game airs on 1270 and kscbnews.net.